We are the Arborist Direct Glasgow team of local Glasgow tree surgeons. 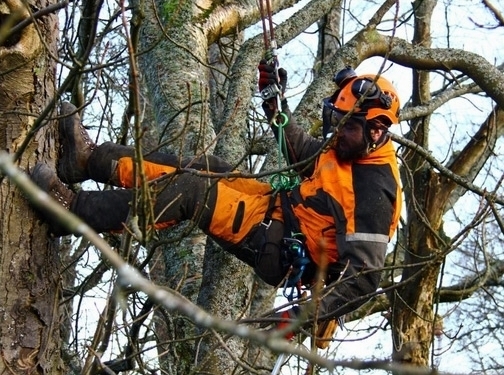 We have experienced climbing tree surgeons who are capable of tackling even the biggest trickiest trees. Trained and qualified in arboriculture, our team offer a professional local service working to the national standards of Arborist Direct. We provide quality tree care services at competitive local prices and always aim to leave our customers happy and satisfied with our work. We love Scotlands trees and the environments they improve and we take pride in being able to help keep our clients trees healthy, beautiful and safe. From planting saplings to large tree felling and removal can work on anything tree related. We can advise on and carry out tree pruning to allow access, let more light through a canopy and reduce a canopy to make it safer in the wind. Crown thinning, crown reduction and crown lifting. We can carry out tree planting and advise on what species you can use. When branches or trees are damaged from high winds we can safely take out any damaged sections and will always do our best to save the tree wherever we can. National standards at a local level with competitive local rates. You can call us with any inquiries on 0141 280 3059. Call or fill in our contact form and we will be happy to give advice and provide a FREE quotation. UK (Glasgow) based business providing a range of tree surgery services. Website includes details of services provided, work examples, full contact details.